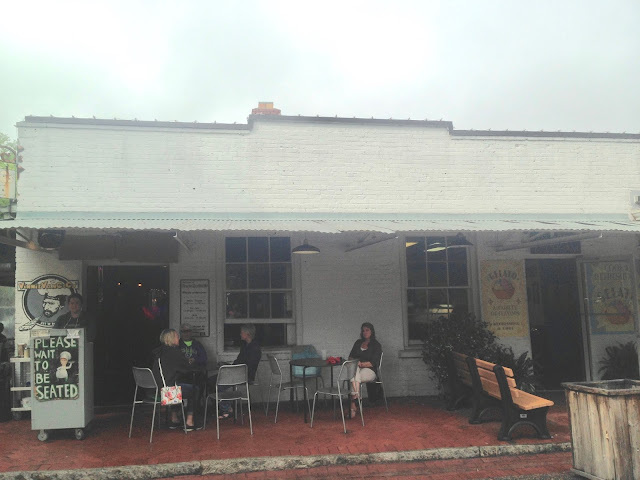 Today begins my very first travel post of Savannah, Georgia. We were there at the end of April for 3 1/2 days and 4 nights. And although I think that's a descent amount of time to explore the city, we could have easily spent another week there to see more. There is so much to do! 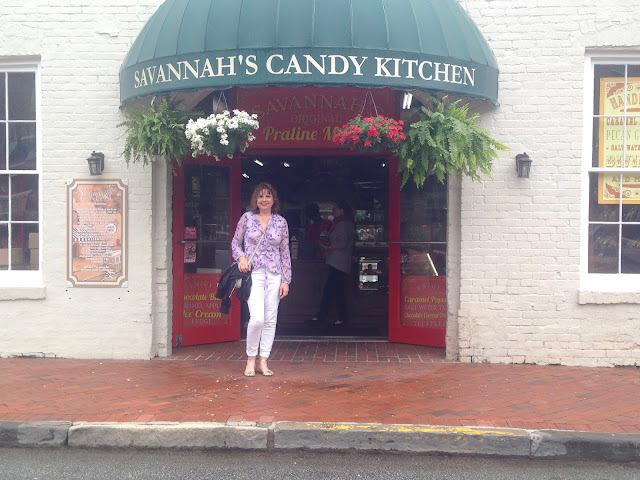 When planning our trip to Savannah every one advised taking a trolley tour on your first day to get acquainted with the city and get your bearings; so that is what we did! There are many different trolley companies and packages that tour Savannah. We picked the "Overview" package with the Old Savannah Tour Company. Our tour was a 90 minute ride through all the highlights of historic Savannah and it included some special visitors at various spots! Right away my husband and I were oohing and ahhing at all the gorgeous homes! I squealed with delight when I spotted this one. Do you recognize it? Don't worry if you don't, as we toured this home the very next day...but that is for another blog post. Let's just say this home is "Infamous" for a well known murder that sparked one of the best selling books of all time...hint, hint! And now here were our special visitors. I have to tell you I am so gullible that when this guy jumped on our trolley I started to remove my bag off a empty seat to make room for him. haha! But he wasn't a tourist, but an actor. 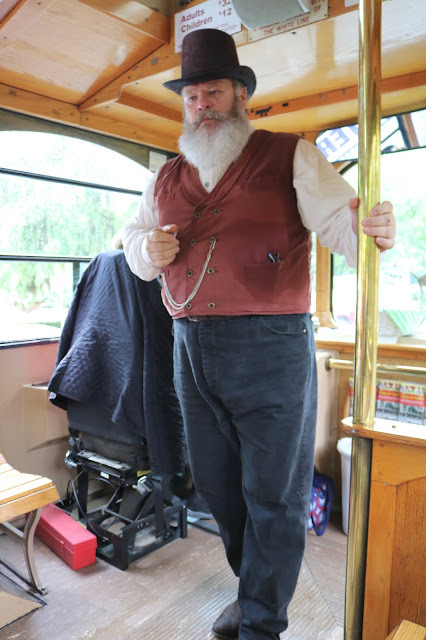 Three actors joined our trolley at various stops and shared a bit about Savannah with the tourists. Charles Green, a cotton factor who went to Savannah when he was a teenager and made a fortune! All the actors were so good and very entertaining. I enjoyed the unique way they provided the history of Savannah compared to just a tour guide. The tour company has many different actors/characters, but only three join your trolley so you have no idea who you will get! When the actors weren't doing their monologue, the trolley driver provided all the information of the history of Savannah and it's buildings. She also provided practical information like the best places to eat and shop and what homes were open for tours. My husband took a ton of photos while on our trolley ride. Below are some of the best ones that represent Savannah. There were so many gorgeous, amazing churches in Savannah! I'll probably do a post just on all the churches alone. I loved the architecture. Savannah is known for it's moss covered trees. They line every street and fill every single square. Our tour guide said the ivy growing on the limbs opens up when it rains or is moist and then shrivels away when it's dry. Here it is all opened up because they received rain that morning. This is the police headquarters. I loved the old police cars out front. Our tour guide informed us that the little tiny house in the center of the picture is only 500 square feet and recently sold for $500,000!!!!! Can you believe that? Location, Location, Location! There are many similarities of Savannah to New Orleans, like the use of wrought iron. This is the Thomas Owens house. We also toured this one, so I will tell you more about it in a later post. Your admission ticket to the Thomas Owens House also includes admission to two art museums. We actually enjoyed this art museum more than the house tour because it was once a house too! It was very grand! The trolley also took us down to the famous River Street. And yes, this is the road that leads you there! River Street was unbelievable! I could not believe how old all the buildings and roads were. There was so much pirate history there too! But, more on River Street for a later blog post. The best advise we received for Savannah was from an employee at the Visitor Center. She informed us about the cities "Free Shuttle Service". Although in the historic center, the home that we rented was quite a hike from most of Savannah's attractions. 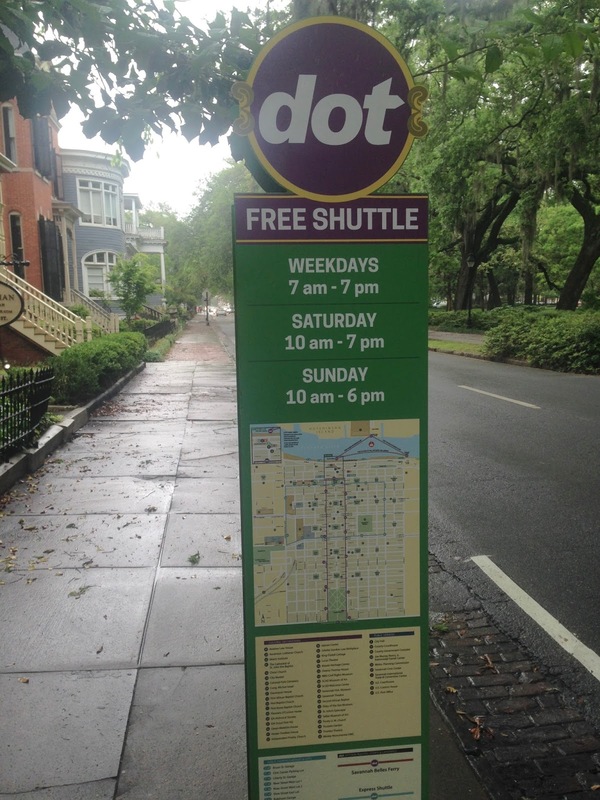 But the "Dot" bus stop was only two blocks away from our house, so we were able to jump on the shuttle and save some steps many times! After our Trolley Tour we then headed to the house we rented for the week to check in. The house was so gorgeous and amazing that I want to do a separate post about it next week. I just have too many photos to include and it would make this post too long. Once we checked in and freshened up we headed out to dinner. We took the trolley to City Market to check out a pizza place our landlord recommended. It's called Vinnie Van Go-Go's. It's a cash-only pizza place and is considered to have the best pizza in Savannah. It was definitely quite the interesting atmosphere. This is the outside of the building, where most people eat as there is not much of an inside. Here is my hubby patiently waiting for his dinner. I just love quirky places like this. So many people recommended fancy, high-priced restaurants to us, but these are the types of establishments we prefer. Fun, different, good food without the fuss! And yes, the pizza was delicious! One slice of pizza was only $3.50, but then you had to pay 50 cents for each additional topping...so it does add up. This is the inside of the restaurant. Basically just a bar with a few tables on the end. But you can watch them make the pizza dough, which is always a fun sight anywhere. Look how low the ceilings are! We noticed a lot of low ceilings in Savannah, especially on River Street. After dinner we explored City Market a bit. It is a four block open-air market since the 1700s with shopping, dining, and artworks in restored warehouses . There is also musical entertainment in the street as it is closed off to traffic. I must admit I was not that impressed with City Market as I didn't think there was a whole lot of shopping there. I was however very impressed with this candy store. This is a company that has several locations throughout Savannah, but I thought this store was the best of all the locations. They have a train riding overhead, and you are able to see the cooks create all the candies. The candy was delicious too! I got some dark chocolate bark and my husband purchased a turtle. Next week I will show you the beautiful home we spent four glorious nights in! Savannah is on my list of places to visit! It looks so beautiful! Definitely have to get there Brooke! It's a fashion photographers dream! Is it weird that I don't know what book you're mentioning! :( I've never been to Savannah, but I have been to New Orleans and I can definitely see the similarities. The book is "Midnight in the Garden of Good and Evil" which was also made into a movie directed by Clint Eastwood and starring Kevin Spacey, John Cusack, and Jude Law. Oh that architecture, what a pleasant trip that must have been. Hugs, x. Lots of great pics! Sounds like you all had a great time! We love all things history. So if we were to visit we would want to tour and see the old history of Savannah Georgia. The food does look delicious. Yes, so do my husband and I! Amy, Savanna is one place I haven't visited. My sisters and I take a trip each year and this is one of the places on our list. My husband and I seem to like the same type of eating places as you all. In my opinion it is only food and it upsets me to spend a lot of money then maybe not like what you ordered. Savannah would make a great girls trip! You must go. I'm thrilled to find someone who thinks like I do when it comes to eating in restaurants. I love good food as much as the next person, but I struggle with parting with my hard earned cash to pay for it. What a fun and history rich city, would love to go someday. You look so pretty in that purple! It really is a fun historic city, and thanks for the compliment! I've been told purple is one of my colors. It's been hard to find clothes in that shade, but since Pantone made it it's color of the year, it's been getting easier! Nice pictures, impressive houses! I can imagine how fun the trolley ride must have been! The pizza slices look huge and delicious! Thanks Elli!, it was fun, and the pizza really was delicious. We loved it so much, we went there a second night for dinner. haha! Yes, the pizza was so good! I know, I always think of Gone with the Wind when I was in Charleston and Savannah. Savannah is one of our favorite cities - no idea what it is about it, but it captures you - heart & soul. I have wonderful memories of the trolley ride there, celebrating New Year's Eve on the waterfront, and even discovering that dark beer goes well with strawberry shortcake! I so agree Donna. We went to Charleston last year, and although I liked it there, I prefer Savannah. It seemed more real to me, if that makes sense. I love the old homes; they're beautiful. It sounds like you had a marvelous time! Thank you for sharing some of it with us! Yes, we love old homes too. Especially ones that retain the original architecture yet are modernized with light colors, good lighting, and a mix of modern furniture. I love all that history - the house fronts are just gorgeous. Also thought those actors and their outfits were a wonderful addition to the "feel" of the place. 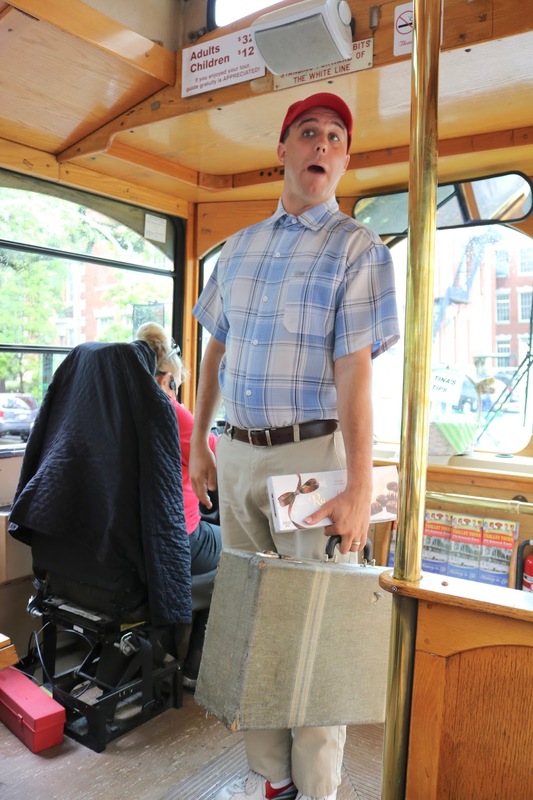 Yes, the actors added a lot to the trolley tour. I don't know if all the different tour companies include actors, or just this one. Savannah has so much history! I am loving your shots, lady- thanks for sharing! Oh what a fun way to see the city! the actors look like a really entertaining addition. The architecture is beautiful too, we have nothing like that in Brisbane! Thanks Mica! That surprises me about Brisbane, but my Australia history is limited. haha!